For most school age children and adolescents, a huge fear is forgetting the memories of a loved one who has died. This is true for everyone, but children especially need a place to keep those memories safe. One of my favorite activities is creating a box especially for those precious memories. This gives the child some control and facilitates a time in extreme sadness to smile, laugh and enjoy the life that was lost through story telling. 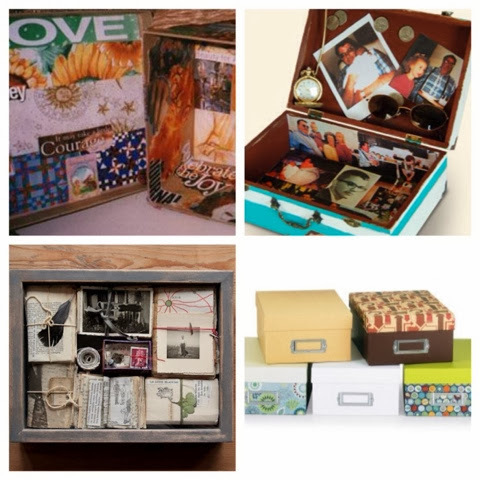 Memory boxes can be as easy as finding a cardboard box and creating a collage of pictures, letters, magazine cut-outs and other precious items to make it personal. Another idea is to buy a shadow box that can be displayed in the home or in the child's room after it is completed. Here are some simple examples I found when searching pinterest. The most important thing to remember is that the child should be in charge of their own box and allowed to use creativity to process the death through the activity. If pictures and items are not available, pieces of paper can be used to write down individual memories or stories. The best part of creating a memory box is that it can be added to any time a new memory comes to mind or a new trinket is discovered.